Amazonian deforestation rates have recently declined, largely due to Brazil’s environmental policies.3IIRSA puts this felicitous outcome into question by bringing new interests and alliances to bear on Amazonia with a $27 billion infrastructure package of national, binational, and multinational projects, in addition to those being undertaken independently by UNASUR’s member states. The overall objective is to reconfigure the basin with highways, waterways, railways, and ports, and to supply an abundance of energy with hydropower. Presently, 177 dams are either built or under construction, with an additional 241 planned, and 220 sites inventoried. Thus, UNASUR’s Amazonian vision entertains as many as 638 dams, with the potential to generate more than 151 gigawatts, about 15% of the electrical capacity dedicated to manufacturing in the United States.4 A key element of the overall UNASUR drive is a Brazilian project aimed at the central Amazon basin, the Tapajós Hydroelectric Complex (THC), consisting of five dams projected to generate more than 12,000 megawatts, which would make it one of the largest hydropower facilities in the world. 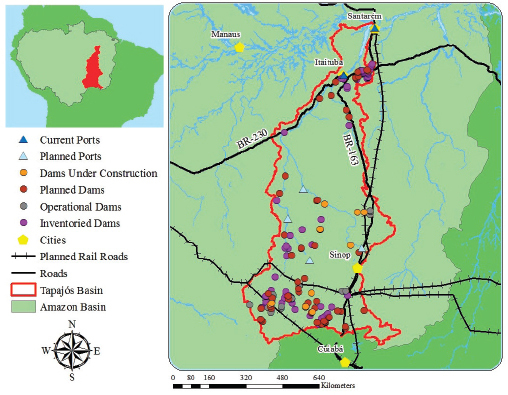 During the THC planning phase, an environmental impact assessment (EIA) was undertaken by the Tapajós Study Group for the Brazilian Institute of Environmental and Renewable Resources (IMABA), as required by law.5 Its analyses predict that, fully implemented, the THC will significantly lift the region’s level of development. A secure source of reliable energy will stimulate industrial investments, and local residents will benefit from electrification, with new connections established in towns across the Tapajós watershed including Itaituba (3,191), Novo Progresso (784), Aveiro (224), Ruropolis (1,238), and Trairão (498). The THC will also have a big impact on employment by creating 25,000 direct jobs, and generating another 40,000 through multiplier effects.6 These desirable economic outcomes projected for the THC will be amplified by the larger infrastructure design for the region, which includes over 40 large dams, improvements to Highway BR-163, the construction of silos and barge wharfs near the town of Itaituba, a 600-mile railway from Cuiabá to Santarém, and a 900-mile waterway meant to transform the Tapajós River into the Mississippi of Amazonia, by linking Mato Grosso State with port facilities on the Amazon River7 (see Figure 1). 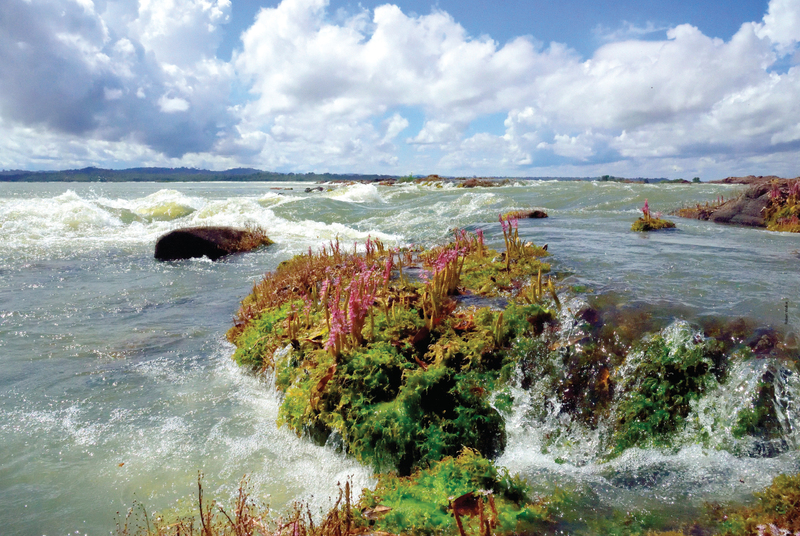 The Tapajós is one of the basin’s largest rivers. From its headwaters in the central plains of Brazil, it flows about 1,900 kilometers and drops some 300 meters, a topographic feature creating abundant hydropower potential. From an aesthetic perspective, the Tapajós must be regarded as one of Amazonia’s most spectacular waterways, with the feel of an ocean in its downstream breadth of 18 kilometers. The shorelines are carpeted with forest, and luxuriant green banks rise to 80 meters. In many places, the river is lined by white sand beaches reminiscent of the Caribbean, and attracting many tourists. The Tapajós Basin is large, about 770,000 square kilometers, larger than Texas (700,000 square kilometers) and harboring a considerable fraction of Brazil’s Amazonian forest biome. An ecologically diverse region, it encompasses the ecotone between moist tropical forest and the cerrado, a savanna with shrubs, trees, and gallery forests. 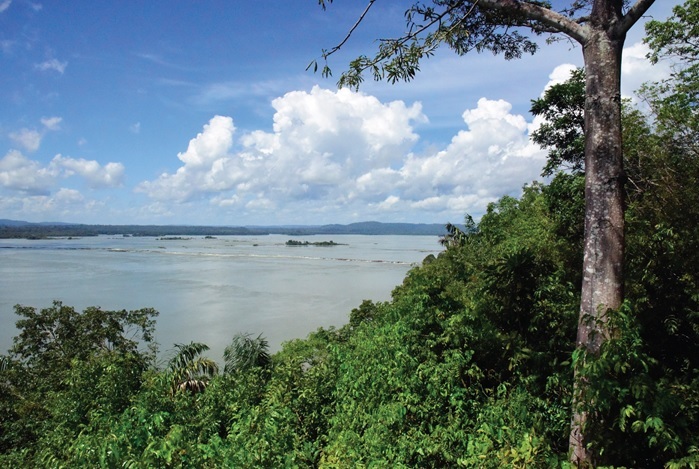 The Tapajós discharges into the Amazon River where the alto plano of western Pará State forms an abrupt escarpment that folds around Santarém, once a quiet fishing village and now a bustling port town. It was here that Gaspar de Carvajal, accompanying Francisco de Orellana on the first European descent of the Amazon River in 1543, described large populations of warlike Amerindians.9 These were the Tapajós, a tribe that vanished into history, probably from Portuguese slavers and diseases, opening the valley to a new influx of indigenous peoples such as the Munduruku. A succession of European and Brazilian explorers traveled the Tapajós Valley, which during the colonial period served as a trade route between Mato Grosso and the Amazon River. The rubber boom brought a surge of economic growth to the region through the latter part of the 19th century, during which Santarém grew and new settlements sprang up on the riverbanks, down to the fall line near present-day Itaituba. It was from the Tapajós Valley that Henry Wickham stole rubber seeds for the British government, given the high quality of Tapajós latex.10 This notorious deed brought depression to the extractive economy that had generated considerable wealth for Amazonia and Brazil as a whole. New dam designs with “run-of-the-river” turbines reduce reservoir size, and “platform” installation flies workers to construction sites, obviating the need to build roads. Proponents of the THC proposed a platform installation, meant to minimize direct ecological impacts by reducing the migratory influx of poor farmers in search of land. Unfortunately, the environmental impacts of a hydropower facility in frontier areas like Amazonia diffuse far beyond its immediate location, given synergies with highways, waterways, ports, and other dams. Further, they accumulate through time and are not immediately apparent, or even knowable. The Brazilian government stipulates that large infrastructure projects assess such synergistic and cumulative environmental effects, but these were neglected for the THC. Although the project will have substantial, if understated, environmental impacts on its immediate vicinity, the full effect will manifest through time by virtue of synergies with the larger IIRSA portfolio. Thus, the THC will contribute to a basin-scale impact that is greater than the sum of the environmental harms associated with IIRSA’s individual projects. The Munduruku were originally a warrior people feared by other tribes and the colonial authorities, which might explain their present-day willingness to confront the Brazilian State in defense of their territories.20 The current situation, effectively a tense standoff between the Munduruku and the pariwat(outsiders), began in protest against the momentum of infrastructure development at the turn of the millennium, culminating in their alliance with the Kayapó and other tribes in 2011 to stop the Belo Monte project on the Xingu River. Failure in this venture, and growing concerns about the intentions of the Brazilian government in the Tapajós Valley, marked a turning point in Munduruku political strategy. They retreated from the relative pacifism with which they had met pariwat developers on the Xingu River, and looked to their warlike past for strategic inspiration. Consequently, a movement was born, Ipereğ’ayũ, which translates as “We are strong. We know how to protect ourselves and all we believe in.” Ipereğ’ayũ seeks to assert the territorial rights of the Munduruku, and uses direct action to pursue its goal, the cessation of all infrastructure projects they deem threatening to the lands they claim.21 Ipereğ’ayũ has built a unity of effort across dispersed populations that are quite autonomous. It has also sought alliances among supportive pariwat, including environmental nongovernmental organizations (NGOs) and sympathetic public prosecutors. Such an alliance is responsible for the cancellation of the license for the SLT dam in August, 2016. The Munduruku have continued their campaign since then, most notably with the occupation of the 700 megawatt São Manoel Dam Power Plant in July 2017. The dam, located on the Teles Pires tributary, sits directly on the upstream border of the Apiaká-Kayabi Reserve, home to three tribes, the Apiaká, the Kawaiwete, and the Munduruku. A Sustainability Transition for Amazonia? Ecosystem services are conceptualized as public goods, which inhibits spontaneous conservation through a market exchange based on price.25 Responsibility for their protection therefore falls to government, as society’s public goods provider and regulator of intergenerational equity.26 Although government often achieves conservation outcomes, as with the creation of national parks worldwide, the planning horizons of politicians are short given impatient constituents and a variety of political forces. As a result, the decisions they make about large-scale infrastructure investments tend to privilege development. In other words, a short planning horizon favors immediate economic gain over the value of ecosystem services accruing to future generations. This is by no means a purely theoretical reflection, as the case of Brazil demonstrates. To make way for the construction and operation of the SLT dam, the administration of former President Dilma Rousseff redrew the boundaries of Amazon National Park (ANP), adding remote parcels, while removing lands along the river to facilitate implementation of the THC. Altogether, 47,080 hectares were taken from ANP, and 804 hectares were added by way of compensation, yielding a net loss.27 At basin-scale, ANP is just one of many similar cases; in August 2017, President Temer opened a protected area of ~46,000 square kilometers in the state of Amapá to private mining interests.28 Such actions suggest an institutional weakening of the protected area as a conservation tool in Brazil, despite its mention in the INDC, although not as a prime agenda item. Reducing the size of Amazonia’s protected areas points to an undervaluation of ecosystem services by the Brazilian State, as well as by IIRSA. There is little reason to expect that development forces will value them sufficiently to walk away from a banquet of mineral exploitation, industrialization, and agricultural export. Amazonia: Low Rent and Obsolete? Recently, payment for ecosystem services (PES) has gained traction as a policy alternative to the regulatory approach of government. The emergence of carbon credit markets is germane, given recent conservation applications in Amazonia. Little headway has been made due to a number of factors, including the high opportunity costs involved. For example, in the Tapajós Valley, soybean agriculture generates substantially more income than payments for sequestration services. Thus, a landowner who chooses to “sell” carbon by conserving forest misses the opportunity of earning more by engaging in agriculture.29 Although a pricing system has not yet emerged for biodiversity maintenance, a recent proposal argues that an innovative biotech industry could accomplish this spontaneously for Amazonia.30 Industrial development requires a long lead time, however, one that is likely to stretch beyond the Brazilian government’s planning horizon. The implication is that a PES mechanism for “purchasing” biodiversity could achieve a conservation outcome, but only in the future. With respect to the Tapajós Valley, and Amazonia more generally, payments for biodiversity on private holdings will not be available for decades, until long after IIRSA-stimulated growth has exerted its massive impact on the Amazonian forest biome. For the Munduruku, Amazonia is neither obsolete nor a provider of services too valueless to incite them to convert their forest to alternative land uses. In this regard, they are holding their own against modernity, and have even won an important battle. We cannot yet proclaim this a lasting victory, because uncertainties remain about the ultimate disposition of the THC. It is telling that construction of the SLT dam was stopped for purely economic reasons, namely the projection of inadequate aggregate demand for electricity. The implication is that growth in demand could give the green light to development, in which case the short-run victory of the Munduruku becomes a long-run defeat.32 Thus, it is inviting to consider how Munduruku resistance in the Tapajós Valley might be strengthened to make its achievement lasting, to be transformed into a durable force that ensures cultural and ecological conservation in both the Tapajós Valley and the Amazon Basin. Future prospects for the Amazonian forest might otherwise seem bleak, with Brazil’s retreat from a vigorous defense of its protected areas, and with the evident shortcomings of a conservation policy based on PES. Thus, conservation of the Tapajós Valley, and Amazonia more generally, might hang on efforts to cleanse the Constitution of 1988 of ambiguities in the meaning of indigenous rights, and to extinguish archaic views of indigenous incapacity from the statutory environment. This would yield a stronger legal foundation for resisting SS declarations and trespass by large-scale infrastructure projects and private interests seeking mineral wealth. That the Munduruku have strong allies in the Brazilian judiciary provides some degree of institutional support. But challenges are mounting to an indigenous conservation politics, as Brazilian lawmakers seek ways to facilitate the exploitation of indigenous lands. Proposed Constitutional Amendment PEC-215 would impede the regularization of new reserves, and transfer responsibilities for boundary demarcation from Brazil’s Institute for Indigenous Affairs (FUNAI) to the rent-seeking world of the Brazilian legislature.35 More worrisome is an initiative by President Temer’s Agricultural Minister, Blairo Maggi—former governor of Mato Grosso and one of the world’s largest soybean producers—to gut the licensing procedures for large public works projects, effectively making them immune to legal challenge and the objections of civil society. Efforts to dam the Tapajós River and dredge its waterway are but a contemporary manifestation of Brazil’s long-standing dream to develop the Amazon Basin and exploit its natural resources. What began as a national agenda now forms part of a continental initiative, one that brings this dream closer to reality than ever. The momentum of IIRSA puts Amazonia’s forest biome and wild waterways on the historical chopping block, despite the recent decline in deforestation rates. Although the Munduruku Tribe has squeezed out an important victory for cultural and biodiversity conservation, this could evaporate overnight. Regrettably, sustainable development in the Tapajós Valley, and Amazonia more generally, is an illusion if by development we mean what the Brazilian government means, namely, economic transformation via industrial growth and export-driven agriculture.36 Sustainability science would presumably reject the THC as a pathway to sustainability transition, thereby validating the resistance of the Munduruku. But the prescription of sustainability science has all the hallmarks of a self-evident truth. The urgent need of today is to block the infrastructure projects of Brazil and IIRSA, as necessary for biodiversity conservation, not to marshal the scientific reasons for doing so. On the eve of the first infrastructure investments in Amazonia nearly 50 years ago, a development plan was advanced in a publication entitled The Great Lakes System of South America.37 It was produced by the Hudson Institute, a think tank founded by the futurist Herman Kahn, famous for his caricature as Dr. Strangelove in Kubrick’s classic film, and for developing the nuclear annihilation strategy referred to as “mutually assured destruction.” Kahn’s document bears several striking similarities to IIRSA, especially in its proposal for hydropower development throughout the entire Amazon Basin. 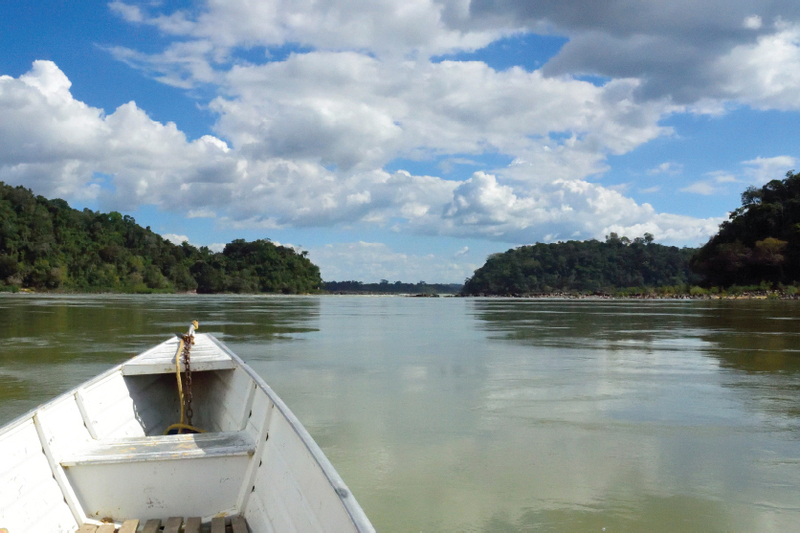 Although the Institute’s approach was rejected at the time, it has proved prescient in its view, shared with IIRSA, that Amazonia needs to be re-engineered in the interest of economic development. Within this grim context, the search for sustainability becomes imperative, and more so every day. 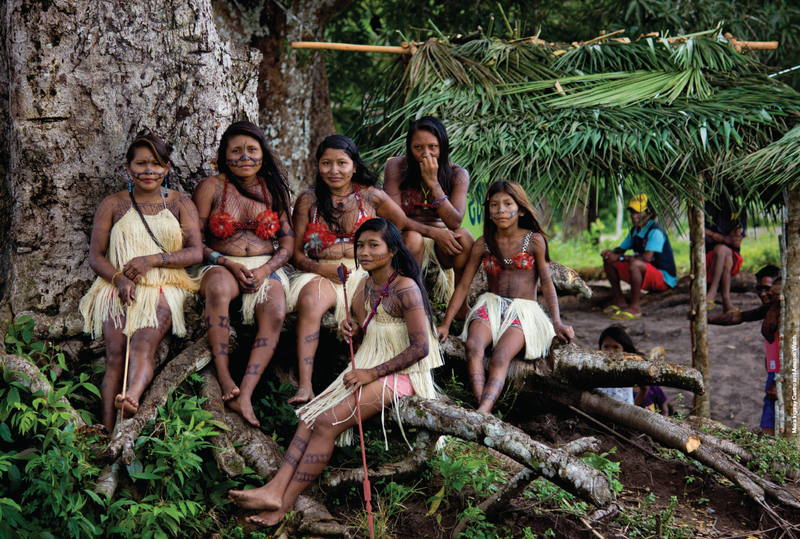 It is doubtful that Brazil’s environmental policies, old or new, hold the key, while the current scale of political resistance by tribal peoples is insufficient to accomplish a conservation miracle. Will Amazonia achieve a sustainability transition, or be obliterated by the mutually assured destruction of its natural and human systems? The only thing certain is that we will have our answer soon. 1. See Timothy J. Killeen, A Perfect Storm in the Amazon Wilderness: Development and Conservation in the Context of the Initiative for the Integration of Regional Infrastructure of South America (IIRSA) (Arlington, VA: Conservation International, 2007). The Belo Monte Dam is found on the Xingu; the Jirau and Santo Antonio dams, on the Madeira. The operating license for the Belo Monte Dam was canceled on April 6, 2017, until sanitation works are completed in the city of Altamira. Ten of its 24 turbines are already operational, and the project plans to be entirely up and running by 2019. See http://www.iirsa.org; Rueters Staff, “Brazil Court Suspends Belo Monte Dam Operating License Over Sanitation,” April 7, 2017. 2. The term resistance connotes both acts of collective opposition to power, and less overt everyday acts of individuals aimed at disrupting the claims of class or cultural elites. Our usage derives from contentious politics, and comprises disruptive actions against dominant state power. The Munduruku, as with other indigenous peoples in the region, have long engaged in less overt acts of everyday resistance to ensure their cultural and territorial integrity. See D. McAdam, S. Tarrow, and C. Tilly, Dynamics of Contention (Cambridge, UK: Cambridge University Press, 2001); J. C. Scott, Weapons of the Weak: Everyday Forms of Resistance (New Haven, CT: Yale University Press, 2001); C. Brown, “Kayapó Courage. The Rich and Powerful Brazilian Tribe Is Battling a Dam That Will Not Die,” National Geographic Magazine 225, no. 1 (2014): 30–55; S. Athayde and M. Schmink. 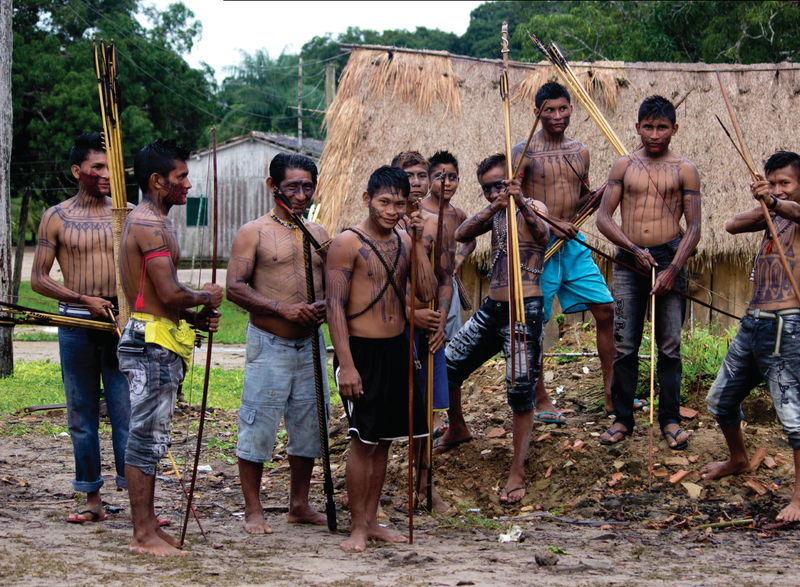 “Adaptive Resistance, Conservation, and Development in the Brazilian Amazon: Contradictions of Political Organization and Empowerment in the Kaiabi Diaspora,” Ethnohistory 61, no. 3 (2014): 549–74. 3. D. Nepstad, D. McGrath, C. Stickler, A. Alencar, A. Azevedo, et al., “Slowing Amazon Deforestation Through Public Policy and Interventions in Beef and Soy Supply Chains,” Science 344, no. 6188 (2014): 1118–23. 4. U.S. Energy Information Administration, Annual Electric Generator Report (Form EIA-860, 2013), www.eia.gov/electricity/capacity. 5. The study group involved Eletrobras and CEMIG, two large electrical utilities, and Camargo Corrêa, Brazil’s second largest construction company, all with a vested interest in the THC. The EIA (Grupo de Estudos Tapajos, Sumario Executivo. Avaliação Ambiental Integrada da Bacia do Rio Tapajós [Ecology Brasil, 2014]) can be found at http://www.grupodeestudostapajos.com.br/site/wp-content/uploads/2014/04/Sumario_AAI.pdf. 6. The population buildup associated with labor-force expansion will add tax revenues to municipalities. Further, the power utilities will provide local governments with financial compensation in relation to their involvement with energy production. This is all projected to occur with a small social downside, the displacement of ~1,300 individuals residing in traditional fishing communities that will be inundated. 7. See p. 48 in D. Fernandes Alarcon, B. Millikan, and M. Torres, eds., Ocekadi: hidrelétricas, conflitos socioambientais e resistência na Bacia do Tapajós (Brasília, Brazil: International Rivers Brasil; Santarém: Programa de Antropologia e Arqueologia da Universidade Federal do Oeste do Pará, 2016). 8. Eletrobras and Camargo Corrêa, both members of the Tapajós Study Group responsible for the THC EIA, have been implicated in corruption linked to the building of Amazonian hydropower facilities (Belo Monte and Jirau). In March 2015, the chief executive officer of Camargo Corrêa confessed to having paid R$100 million (~US$32 million in 2015) in “propinas” (bribes) in the form of clandestine contributions to reelection campaigns (2010, 2014) via the so-called Caixa 2. The company’s payback amounted to 16% of the construction contracts awarded for the Belo Monte project. See Amazonas em Tempo, Delator deverá revelar propina em Belo Monte (Amazonas em Tempo, March 7, 2015), B-3, and http://amazonwatch.org/news/2015/0305-massive-corruption-scandal-implicates-brazils-amazon-dam-builders. 9. C. C. Mann, 1491: New Revelations of the Americas Before Columbus (New York, NY: Knopf, 2005). 10. J. Jackson, The Thief at the End of the World: Rubber, Power, and the Seeds of Empire (New York, NY: Penguin, 2008). 11. Grupo de Estudos Tapajos, Sumario Executivo. Avaliação Ambiental Integrada da Bacia do Rio Tapajós (Ecology Brasil, 2014: http://www.grupodeestudostapajos.com.br/site/wp-content/uploads/2014/04/Sumario_AAI.pdf). Species inventories for the Tapajós include P. A. Buckup, M. R. Britto, J. R. Gomes, J. L. Olivan Birindelli, F. C. Thadeo de Lima, J. Maldonado-Ocampo, and C. H. Zawadzki, Inventário De Peixes In: Delineamento Da Ecorregião Aquática Xingu-Tapajós, Cetem. Relatório Técnico elaborado para o Conselho Nacional de Desenvolvimento Científico e Tecnológico—CNPq como documento final do projeto “AquaRios—Delineamento da Ecorregião Aquática Xingu-Tapajós” (Edital MCT/CNPq/CT-Hidro 037/2005, Processo n 557321/2005, 2010); M. Camargo, J. Carvalho Júnior, and R. A. Estupiñan, “Peixes Comerciais Do Xingu,” in Delineamento Da Ecorregião Aquática Xingu-Tapajós, Cetem. Relatório Técnico elaborado para o Conselho Nacional de Desenvolvimento Científico e Tecnológico—CNPq como documento final do projeto “AquaRios—Delineamento da Ecorregião Aquática Xingu-Tapajós” (Edital MCT/CNPq/CT-Hidro 037/2005, Processo n° 557321/2005, 2010); M. Camargo, T. Giarrizzo, and V. Isaac, “Review of the Geographic Distribution of Fish Fauna of the Xingu River Basin, Brazil,” Ecotropica 10 (2004): 123–47; M. Camargo, T. Giarrizzo, and J. Carvalho Júnior, “Levantamento Ecológico Rápido da Fauna Ictica de Tributários do Médio -Baixo Tapajós e Curuá,” Boletín Museu Emílio Goeldi, Série Ciências Naturais, Belém 2, no. 1 (2005): 229–47; IUCN, IUCN Red List of Threatened Species, VerSão 2010.1, www.iucnredlist.org (2012); and CITES (Convention on International Trade in Endangered Species of Wild Fauna and Flora), http://www.cites.org (2012). Studies of key aquatic species include J. Pezzuti, M. Vidal, and D. Felix-Silva, “Impactos da Construção de Ursinas Hidrelétricas sobre Quelônias Aquäticas Amazônicas,” in Fernandes Alarcon et al., note 7, 455–77; and R. Barthem, E. Ferreira, and M. Goulding, “As Migrações do Jaraqui e do Tambaqui no Rio Tapjós e suas Relações com as Usinas Hidrelétricas,” in Fernandes Alarcon et al., note 7, 479–510. 12. M. Fujita, P. R. Krugman, A. J. Venables, and M. Fujita, The Spatial Economy: Cities, Regions and International Trade, Vol. 213 (Cambridge, MA: MIT Press, 1999). 13. T. O. Michielsen, “The Distribution of Energy-Intensive Sectors in the USA,” Journal of Economic Geography 13, no. 5 (2013): 871–88. 14. E. Y. Arima, P. Richards, R. Walker, and M. M. Caldas, “Statistical Confirmation of Indirect Land Use Change in the Brazilian Amazon,” Environmental Research Letters 6, no. 2 (2011): 024010; R. Walker, “Sparing Land for Nature in the Brazilian Amazon: Implications From Location Rent Theory,” Geographical Analysis 46, no. 1 (2014): 18–36. 15. E. Y. Arima, R. T. Walker, C. Souza, Jr., R. Pereira, and O. do Canto, “Spontaneous Colonization and Forest Fragmentation in the Central Amazon Basin,” Annals of the Association of American Geographers 103, no. 6 (2013): 1485–501. 16. For deforestation and tipping points, see T. M. Lenton, H. Held, E. Kriegler, J. W. Hall, W. Lucht, S. Rahmstorf, and H. J. Schellnhuber, “Tipping Elements in the Earth’s Climate System,” Proceedings of the National Academy of Sciences 105, no. 6 (2008): 1786–93; C. A. Nobre and L. De Simone Borma, “‘Tipping Points’ for the Amazon Forest,” Current Opinion in Environmental Sustainability 1, no. 1 (2009): 28–36. For global warming and external climate forcing in Amazonia, see L. F. Salazar, C. A. Nobre, and M. D. Oyama, “Climate Change Consequences on the Biome Distribution in Tropical South America,” Geophysical Research Letters 34, no. 9 (2007). 17. R. S. Walker, S. Wichmann, T. Mailund, and C. J. Atkisson, “Cultural Phylogenetics of the Tupi Language Family in Lowland South America,” PloS ONE 7, no. 4 (2012): e35025. 18. https://pib.socioambiental.org/en/povo/munduruku and John Hemming, Red Gold: The Conquest of the Brazilian Indians (New York, NY: Macmillan, 1978). One large reserve resides on the right bank of the Madeira River (the Coatá-Laranjal Territory). 20. R. F. Murphy, Headhunter’s Heritage: Social and Economical Change Among the Mundurucu Indians (Berkeley, University of California Press, 1960); D. Horton, “The Mundurucú,” in J. H. Steward, ed., Handbook of South American Indians, Vol. 3. (Dearborn, MI: University of Michigan–Dearborn, 1963), 271–82. 21. The Munduruku position is forcefully stated in their letter to the Brazilian government, delivered on June 8, 2013. See https://pib.socioambiental.org/files/file/PIB_verbetes/munduruku/munduruku%20letter.pdf. 22. R. Walker, N. J. Moore, E. Arima, S. Perz, C. Simmons, et al., “Protecting the Amazon With Protected Areas,” Proceedings of the National Academy of Sciences 106, no. 26 (2009): 10582–86. 23. R. W. Kates, “What Kind of a Science Is Sustainability Science?,” Proceedings of the National Academy of Sciences 108, no. 49 (2011): 19449–50. 24. For the Paris accord see http://unfccc.int/paris_agreement/items/9485.php; for Brazil’s INDC see http://www4.unfccc.int/Submissions/INDC/Published%20Documents/Brazil/1/BRAZIL%20iNDC%20english%20FINAL.pdf. 25. R. D. Simpson, Ecosystem Services: What are the Public Policy Implications? (Bozeman, MT: Property and Environment Research Center, 2016). 26. W. J. Baumol, “On the social rate of discount.” The American Economic Review 58, no. 4 (1968): 788-802. 27. For Amazon National Park see J. E. Laue and E. Arima, “What Drives Downsizing of Protected Areas? : A Case Study of Amazon National Park,” Journal of Latin American Geography 15, no. 2 (2016): 7–31. The removal of land from Amazon National Park also included areas that had been occupied in the northeastern part of the park. Of the total land condemned, 37.3% is accounted for by plans for the THC, and 62.7% by colonization. 28. H. Martins, M. Vedoveto, E. Araújo, P. Barreto, S. Baima, C. Souza, Jr., and A. Veríssimo, Critical Protected Areas in the Brazilian Amazon(Belém, Pará, Brazil: IMAZON, 2012). 29. For carbon prices see A. Goldstein, Converging at the Crossroads: State of Forest Carbon Finance 2015 (Forest Trends Ecosystem Marketplace, 2015); for land values see W. Castro, The Last Agricultural Frontier in Amazonia: Impacts on Landscapes and Smallholders(Gainesville, FL: University of Florida, Geography Dissertation, 2016). 30. C. A. Nobre, G. Sampaio, L. S. Borma, J. C. Castilla-Rubio, J. S. Silva, and M. Cardoso, “Land-Use and Climate Change Risks in the Amazon and the Need of a Novel Sustainable Development Paradigm,” Proceedings of the National Academy of Sciences 113, no. 39 (2016): 10759–68. 31. For carbon sequestration see E. Kolbert, “Can Carbon Dioxide Removal Save the World?,” The New Yorker, November 20, 2017. For biodiversity see G. M. Church and E. Regis, Regenesis: How Synthetic Biology Will Reinvent Nature and Ourselves (New York, NY: Basic Books, 2014). 32. On January 2, 2018, two high level officials in the Brazilian government — Luiz Augusto Barroso, President of the Federal Energy Planning Agency, and Paulo Pedrosa, executive secretary the Ministry of Mines and Energy – made public statements suggesting that developing hydropower in Amazonia could prove too costly in terms of environmental and social impacts. This must not be misconstrued as a sea-change in the momentum of IIRSA, in the absence of legislative action, administrative rulings, or constitutional change. See https://news.mongabay. com/2018/01/brazil-announces-end-to-amazon-mega-dam-building-policy/. 33. L. Valenta, “Disconnect: The 1988 Brazilian Constitution, Customary International Law, and Indigenous Land Rights in Northern Brazil,” Texas International Law Journal 38 (2003): 643–61. 34. See p. 79 in Fernandes Alarcon et al., note 7. 35. Brazil has not ratified the International Labor Organization (ILO) Convention 169, which moves away from a view of indigenes as incompetent wards of the state toward a recognition of the right to self-determination. Administrative procedures of project implementation affecting indigenous areas call for consultation with residents, a lynchpin of ILO Convention 169. Consultation is not to be confused with participation in the decision-making process. See C. S. Simmons, “The Local Articulation Of Policy Conflict: Land Use, Environment, and Amerindian Rights in Eastern Amazonia,” Professional Geographer 54, no. 2 (2002): 241–58; L. Valenta, “Disconnect: The 1988 Brazilian Constitution, Customary International Law, and Indigenous Land Rights in Northern Brazil,” Texas International Law Journal 38 (2003): 643–61. 36. J. Watts, “Brazil’s Mega Hydro Plan Foreshadows China’s Growing Impact on the Amazon,” The Guardian, October 5, 2017, https://www.theguardian.com/world/2017/oct/05/brazil-amazon-tapajos-hydrovia-scheme. 37. R. B. Panero, A South American “Great Lakes” System (Washington, DC: Hudson Institute, 1967). Robert Walker is a professor of Latin American studies and geography at the University of Florida. Cynthia Simmons is an associate professor of geography at the University of Florida. Both have taught at the Federal University of Pará, in Belém, Brazil.